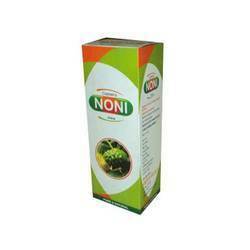 With an experience of more than three decades, we are catering to the requirements of our patrons by providing Noni Juice. The juice provided by us is well processed from high quality ingredients under the guidance of our qualified professionals. This is mainly used for providing relief from various types of deceases. In addition to this, it is examined on diverse parameters by our pharmacy experts to ensure its effectiveness. Looking for Third Party Manufacturing Of Herbal Cosmetics ?